1930 August 27th - Launched.
" December 19th - Delivered as Kenya for the British India Steam Navigation Company. 1940 Left Bombay in convoy for Europe and Government service. 1941 July 23rd - Renamed HMS Hydra while serving for the Royal Navy. Kenya. She carried 297 crew, 1,500 troops and was equipped with 24 landing craft. She had 1 6-inch, 1 3-inch and 12 20mm AA guns. 1942 May 5th - Was present at the Diego Suarez Madagascar landings.
" December - Present at the North African landings. 1943 July - One of the assault ships at the Sicily invasion, Operation Husky. She was the Headquarter Ship for ‘Bark East’ Sector and carried the 231st Infantry Brigade. 1946 April 3rd - The British India Steam Navigation Company did not wish to reconvert the vessel after the War. She was purchased by the Admiralty for £475,000 who then sold her to the Ministry of Transport. 1948 August - Laid up at Holy Loch for sale. 1949 February - Broke adrift from her moorings in a gale went ashore. Later salvaged and repaired at her builders from which she emerged once again as Kenya.
" May - Bought by the Alva Steamship Company but still laid up at Holy Loch. She was relocated to Falmouth and then to Antwerp. 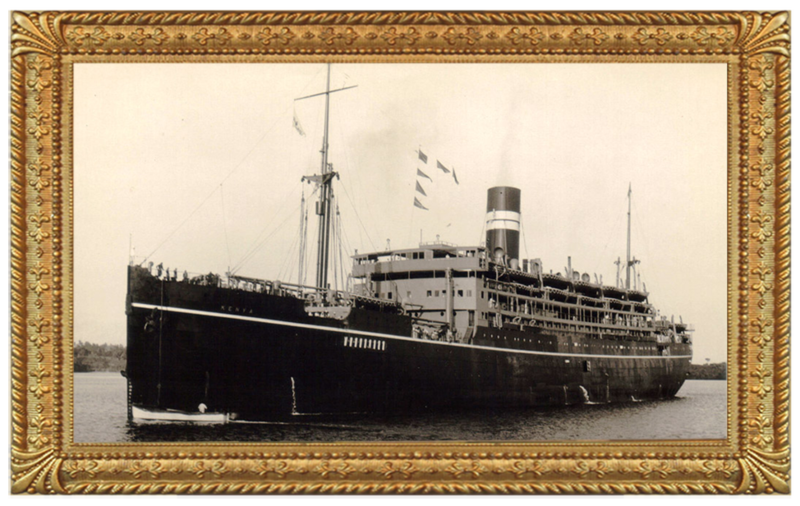 She was renamed Fairstone later that year.
" October - Left in tow for Falmouth. 1951 March - Left Falmouth, bound for Antwerp under her new name Keren. She was transferred to the associated Sitmar Line (Soc Italiana Transporti Marittimi) and was towed to Genoa for a refit. 1952 Renamed Castel Felice. Re-measured. Now 12,478 grt, 7,373 nrt, 5,210 tons. Her passenger capacity now 1,400.
" October 6th - Placed on the Genoa/Sydney and Genoa/South America service. 1954 July 13th - First sailing from Bremerhaven/Quebec. 1955 January 28th - Her passenger accommodation was refurbished at Genoa and the capacity was altered to 1,173 tourist class. 1958 April 6th - Made her first voyage Southampton/Sydney. 1960 March - Suffered damage to one of her propellers by touching the bank of the Suez Canal but at a reduced speed she was able to complete the voyage to Melbourne where repairs were carried out. 1961 Withdrawn for refit. Now 1,400 tourist class passengers. 1968 Ownership transferred to a newly-created subsidiary company named Passenger Line Service Inc.
1970 August 15th - Suffered a fire over three decks while she was berthed at Southampton. October 21st - Arrived at Kaohsiung and broken up after 40 years of service.